There are few flowers that can make a statement like the Delphinium flower can. Its long stalks covered in small blossoms, that run the entire length of the stems, make Delphinium a perfect accent flower to add some gorgeous height to floral arrangements and even bouquets. They can grow up to 6 feet tall! Delphinium can make a bold impression when used as the focal point of an altar arrangement at a wedding, or placed in larger centerpieces, given its striking colors and elegant stature. Delphinium flowers look their best when put in large, airy arrangements. Mix them with hydrangeas and premium roses, or even create a centerpiece made entirely of delphiniums. 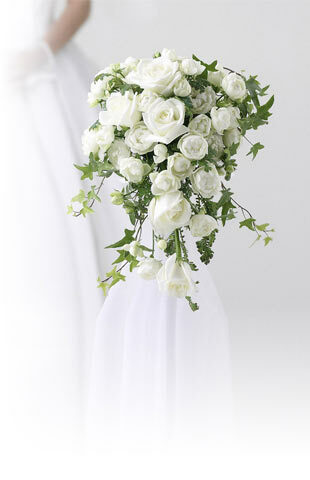 Delicate Delphinium petals also work wonderfully when fluttering down at your wedding as confetti. As vase accent flowers, delphiniums can be mixed in a bouquet with wildflowers, or paired with some of our other blooms such as peonies or anemones for a beautiful addition to any room. 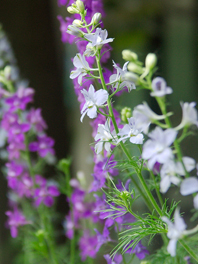 Delphinium is available in whites, blues, purple and pinks. Their vase life can range from 4 to 12 days. For care, display your delphinium flowers away from fruits and vegetables, they can produce a gas called ethylene as they ripen; this causes cut flowers to deteriorate at a much faster rate. Also keep flowers in a cool area out of direct sunlight. Our flowers are grown in the temperate climate of South America, enjoying over 350 days of sunlight per year. We guarantee farm-direct, fresh-cut, and premium-quality blooms.